"Cyclone Komen" has crossed the Southern Coast of Bangladesh Thursday late afternoon. will track N/NW soon as it encounters the STR. Kolkata has received 14 mms till 5.30 pm IST . IMD has announced BB-3 as a cyclone, due to "Intense low pressure system represented on a synoptic chart by more than four closed isobars at 2 hPa interval." The cyclone Komen (BB-3), now formed lies 95 kms South West of Chittagong (Bangladesh), and around 300 kms East-South East from Kolkata. And the Monsoon winds have helped in the formation of strong South quadrant convection and strong winds in the southern quadrant.Estimated core winds at 40 knts (International reading) and estimated core pressure at 989/990 mb. Landfall would be on target, by Thursday (Today) afternoon at the Bangladesh Southern Coast. 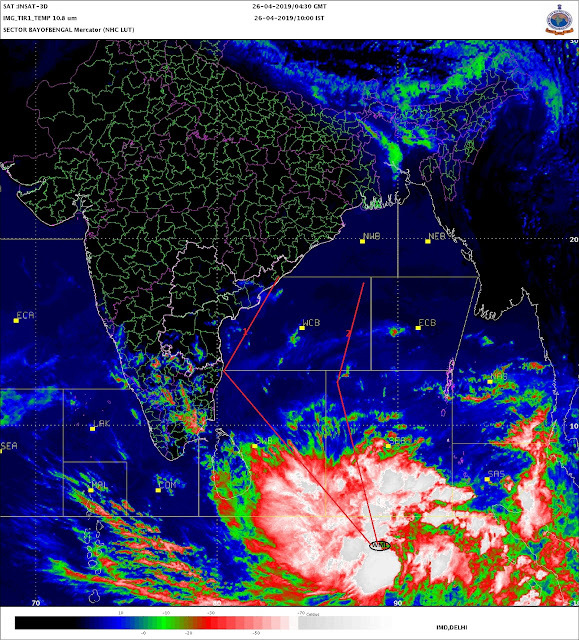 Heavy rains along Bangladesh and W.Bengal coast as well as Odisha coast, with winds around 40-50 kmph. The initial track is North (briefly) and then track would then be W.NW , and weakening would start as explained last night. Inverse relation exists for "South East India - closing towards desertification" - weakening of NEM currents every passing year. Guess somebody should perform similar research. It is quite possible increasing wetness of GUJ / RAJ can bring back lost "Saraswati River"
All unexpected happening as we term it as 'Vagaries of the Weather' !! Few days back were surprise to see Low attaining Deep Depression stage that too on Land surface of desert SW Rajasthan..
Now unexpected cyclone Komen formation means at least by IMD parameters as other global agencies were expecting it but was feeling like IMD may not named it as cyclone !! 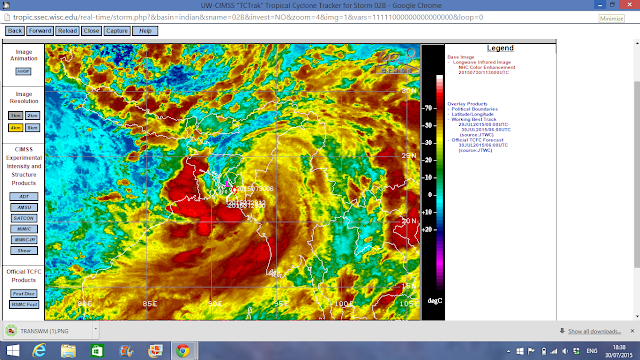 Also it is rare thing to see Cyclone in peak July Monsoon period. This rare event has come after 26 years !! As previous cyclone was seen on 22 July 1989 as per IMD cyclone eAtlas !! Sir very well presented Cyclone Komen. Appreciate the way you present your forecast and pains that you take behind every work you post.